Before the Norman conquest of England in 1066 the manor of Thrupp belonged to Stigand, Archbishop of Canterbury. In 1070 Stigand was deposed and William the Conqueror confiscated his lands. William granted Thrupp to Roger d'Ivry, who sold it to Wadard, a knight in William's court. In 1086 Thrupp was such a small settlement that the Domesday Book did not record it as having any tenants. Thrupp has the remains of a 15th century cross carved from local Jurassic limestone. The cross itself has been lost, but the base and rather weathered shaft survive. The present Manor Farm buildings date from the early part of the 17th century. As well as the farmhouse there are a granary and dovecote from the same period. The farm used to have a watermill powered by the River Cherwell. I was surprised with this tea room. I visited some time back, which was what appeared to be an old farm building out of the middle of nowhere. Convinced I was in for a rough time, I entered this tea room and wow….an immaculate, clean and well presented tea room with a nice owner and staff. The setting is superb…right on a canal with a little bridge, which actually looks like a draw bridge which leads to this lovely tea room with light yellow walls, new tables, clean blue carpet, lovely curtains and simply clean and immaculate throughout. Fresh daffodils on each table added a special touch. Sandwiches, ploughman's, and salads were offered alongside cream teas. Sadly, only English breakfast tea was offered alongside coffee, hot chocolate and cold drinks. A selection of ice cream and ice lollies were available from the fridge. There was a small selection of gifts and wall pictures on sale. An unusual but rather nice fire place seems to be the central theme inside this tea room. What a wonderful discovery. I met the lovely owner and we discussed the tea room for a short while. 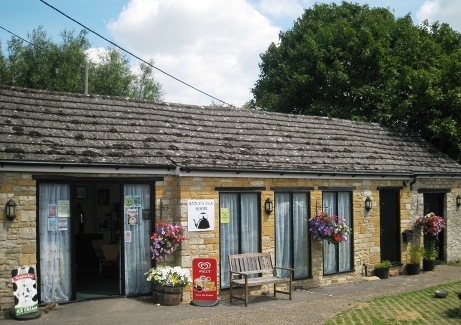 This really is a lovely tea room which I can recommend. Tons of free parking.